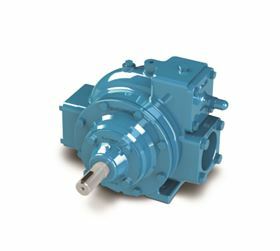 Both the XH Series pumps, which are designed to handle a wide range of non-corrosive and non-abrasive industrial liquids and petroleum products, and the NPH Series pumps, which are ideal for handling viscous or shear-sensitive fluids, feature the same performance characteristics as the NP and X Series models and are available in 2 in, 2.5 in, 3 in and 4 in (51 mm, 64 mm, 76 mm and 102 mm) sizes. Blackmer says the feature that sets the NPH and XH Series pumps from the competition allows the user to choose between 90- and 180-degree porting. The company claims not all other brands have the capability for 180-degree porting in all pump sizes, which gives the NPH and XH pumps more operational flexibility. Standard features on both the NPH and XH Series pumps include an internal relief valve that protects against excessive pressures; a smaller motor for less operational costs; high volumetric efficiency; symmetrical bearing support for extended life; high suction-lift capability that makes them suitable for pumping from underground tanks, bulk-plant service and aircraft refueling; self-priming and dry-run capability; and the unique sliding vane method of operation that Blackmer says results in high-level performance, energy-efficiency, trouble-free operation and low maintenance costs.